2017 to 2018 was a tale of two halves, separated by a malfunction. The end of 2017 continued as the previous months had - a significant lower number of people cycling along Goldsmith's Row. 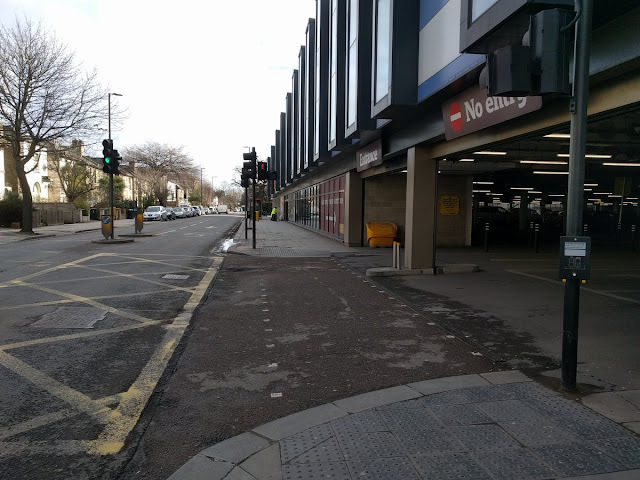 Fewer than 100,000 cycled along here in September 2017, the first time it had dipped below 100k in any September and down from over 122k in September 2014. October was another record low and November was down on last year but still the second highest number of users in any of the five November's so far. December saw just over 56,000 bicycle trips, down from over 74,000 in December 2015 and setting a new low record as the first time less than 60,000 bicycle trips have been recorded in any calendar month. and this was reflected with less than 1000 cycle trips on February 28th (when the average weekday number would normally be over 3,000) and then just 542 cycle trips on March 1st. The cold weather must have affected the sensor buried in the roadway as the cycle counter then stopped working for over a month and a half, which unfortunately means I will have to completely remove March and April from this years' count. This coldwave was followed by a heatwave and the figures for the rest of the year reflect this warm weather. May saw 109k trips, the second highest May total, June saw 115k (third highest June), July had 125k trips (up over 13% on last year and second highest month of all time) and August saw 106k trips. The grand total for the year is also a record low of just over 1 million trips, however this is with almost two months of missing data and so is not an accurate figure. The same applies for the total number of cycle trips for the five year period, which officially stands at 5,861,429 but is likely to be close to 6 million. Hopefully the sensors will continue to work for the next 12 months so we can see if the decrease in numbers or people cycling along Goldsmith's row is a blip or a long term trend. For the fourth year in a row I spent a week this summer cycling around the Netherlands. I'll share my experience of some of those cycle rides between cities later in the year. One thing I have made an effort to do on the last couple of visits is to visit new residential developments, which are usually located on the edge of cities. Today I will write about two of those developments I visited this year and try, as best I can, to show you what these are like. Bear in mind I visited both of these places at the weekend and my visits were short, therefore I only saw a brief snapshot and did not see many daily activities such as the school run, or use routes that might look great to me but actually cause issues for local residents. The first place I visited was Stevenshof, home to around 12,000 people located on the outskirts of Leiden, which I visited within a few hours of arriving in the country. Whilst it could be argued that Stevenshof is not really a "new" development, as construction started in 1982 with the district completed in the mid-1990s, it is still a modern planned development. It is also a good example of how cycle infrastructure was planned from the outset, along with the road network which is laid out to ensure that, whilst all properties can be accessed by car, driving through or within the development is made very difficult, whilst riding a bike is the quickest and shortest transport mode to use. The architecture is very 1980s, certainly nothing like the Dutch-postcard-looking narrow houses in the centre of the city. Most properties here are houses, often with gardens, and it felt very much like a place for families. All streets in Stevenshof are named after well known Dutch women. The main park, Stevenspark, is located directly in the middle of the development, with cycle routes through it. Although important to point out that people don't have to divert to the park to use this "quietway" - there are quiet cycle routes all around it too! Opposite the park is the main shopping centre. This is accessible by car via Stevenshofdreef, with a large car park (with a cycle track along Stevenshofdreef too of course) but there was also another entrance on the other side, which could be reached only on foot or bike. The other new development I visited was Stadshagen, a new suburb of Zwolle. This development is newer than Stevenshof, with construction beginning in the mid-1990s, the shopping centre opening in 2004 and, with over 17,000 residents already living here, construction continues on new housing at the edge of the development. Stadshagen will eventually have between 30,000 and 40,000 residents. 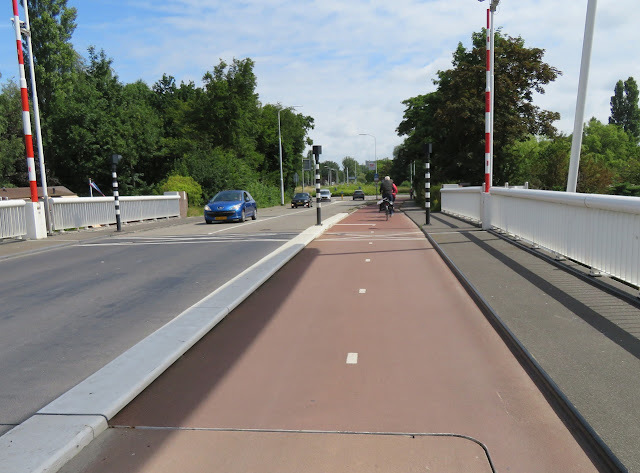 This is because, whilst there are plenty of North-South cycle routes through Stadshagen there are no routes that allow you to drive from South to North or vice-versa. All motor traffic is directed via the ring road along the very edge of the development. Back at the shopping centre there is plenty of cycle parking within the car park - just under 200 cycle parking spaces, 40 of them covered. Alongside this cycle parking the exact same space fits in 18 cars. Note how the residential areas have just one or two access points for motor traffic but people cycling and walking have many different routes to choose from. Whilst it is possible to access all areas by car you cannot drive West to East or North to South through the area; cars must take the longer route and so cycling or walking is always the most convenient option. The other, much busier, East - West cycle route runs south of the shopping centre and park and connects to Twistvlietbrug, the cycle and buses only bridge I mentioned earlier, so is one of the main routes between Zwolle and Stadshagen for those on bicycles. In the picture below you can see a school to the right and a sports centre to the left. This must be a very busy cycle route during the school run! I've also visited new developments in Amsterdam, Utrecht, s'-Hertgenbosch, Zoetermeer and a few other areas of the Netherlands; they are all very similar to what I have tried to show here. The design of these developments ensures that walking and cycling is not only safe but also very convenient. Every area can be safely and easily reached by bicycle, meaning even primary school aged children can cycle to their school and back home again. The networks of where people drive and where they cycle are completely different; through traffic is kept away from the residential areas, which only have one or two access points. If you're cycling it is the exact opposite; cycle routes go through the neighbourhoods. De eerste bewoners van het #Stettineiland maken de straat al typisch Amsterdams. I found it deeply depressing to cycle through the Olympic Park in London near my home less than 48 hours after cycling through Leidsche Rijn, a new development in Utrecht. In the Olympic Park driving is made the most convenient way to get around by default with many new wide through roads constructed or in the planning stages. There are many different routes drivers can take, rat running directly through residential areas, despite there being main roads right alongside. Cycle routes are not planned and cycle tracks are laid down as an after thought, often with obstacles in them making them unusable. Walking is not convenient; in some places you have to use five separate crossings and wait in four pedestrian pens just to get from one side of the road to the other. It is a real shame that with a blank canvas the Dutch can create truly liveable neighbourhoods, but in the UK we don't. There are many examples of how to do it and the benefits it can bring, right on our doorstep. I wish we'd take notice.